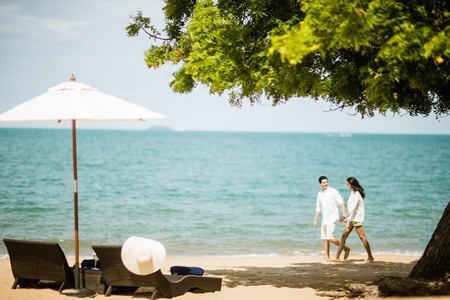 Poised to usher in a new era of upscale hospitality on the pristine Na Jomtien beach, Mövenpick Siam Hotel Pattaya offers travellers a wide choice of elite beachfront accommodation, gourmet cuisine and superb destination experiences, such as yachting and island exploration. Guests can luxuriate in the spacious rooms with bold, modern designs, and take full advantage of the hotel’s impeccable Swiss-style service and extensive offerings, which include contemporary dining, a distinctive lagoon-style pool and unbroken access to an idyllic beach. The Mövenpick Siam Hotel Pattaya is the first five-star resort on Na Jomtien Beach with an uninterrupted beachfront location. Ideally situated for leisure, corporate or incentive-based travellers, Mövenpick Siam Hotel Pattaya is located just 75 minutes from Bangkok Suvarnabhumi International Airport, whilst the regional U-Tapao Airport is only a 20-minute drive away. 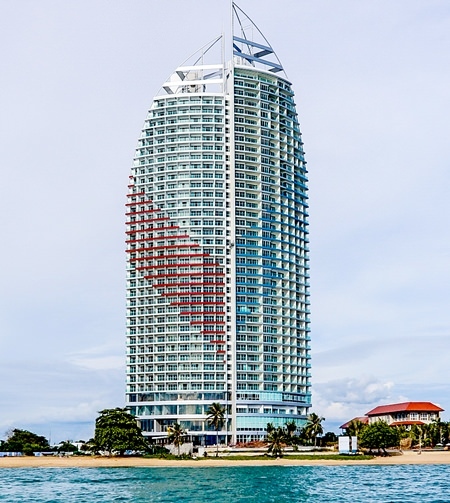 The hotel lies immediately south of the centre of Pattaya City, within convenient reach of all the sites and attractions that make Thailand’s eastern seaboard so enduringly popular. 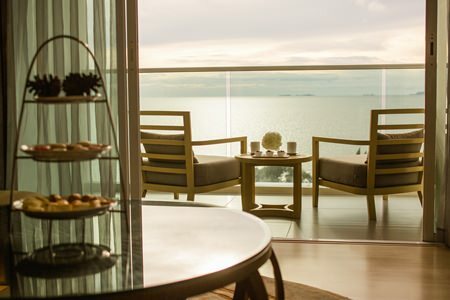 Mövenpick Siam Hotel Pattaya offers a wide choice stylish rooms and comfortable suites. All feature spacious balconies and floor to-ceiling windows, providing panoramic ocean and sunset views. Take an idyllic break in a tropical paradise. Luxury accommodation is available in the form of deluxe sea view rooms, premier rooms, junior suites, executive suites, a family suite and a presidential suite, all equipped with high-speed Wi-Fi, smart TVs, direct-dial phones with voicemail, coffee- and tea-making facilities and in-room safes. The hotel serves exquisite cuisine in fun and convivial surroundings. There are a total of three gourmet dining outlets and signature culinary services, such as the daily Chocolate Hour, when complimentary Swiss chocolate is featured for guests to enjoy. The Executive Suite is an example of the new levels of upscale accommodation and hospitality available at the hotel. Mornings begin at Twist, an all-day dining venue featuring fresh and healthy cuisine served at communal tables in a warm, friendly environment. T55 brings the urban pulse of New York City to tropical Pattaya, with prime cuts of American-raised beef, an unrivalled wine list and industrial design accents. And for a taste of the good life, the lagoon pool offers some light refreshments to enjoy. The pool bar serves snacks, chilled cocktails and refreshing beverages from its swim-up bar and to the sun loungers positioned on the pool deck. The attractive outdoor lagoon pool lies in the midst of tropical gardens, making this the ideal spot for a refreshing dip or some relaxing time in the sun. Meanwhile, total rejuvenation is found at the Wave Spa – the ultimate body-and-soul retreat. 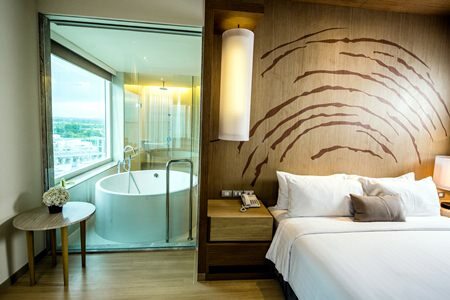 Mövenpick Siam Hotel Pattaya offers a wide choice of luxury guest rooms. An indoor and outdoor kids’ club provides a range of activities for younger guests and the hotel also offers a fully equipped fitness centre, water sports facilities, golf concierge, island cruises, deep sea fishing tours and regional excursions. Mövenpick Siam Hotel Pattaya is an ideal destination for corporate retreats, weddings and banquet dinners. The hotel offers professional event management encapsulating the highest quality standards, creative cuisine and qualified, friendly service. 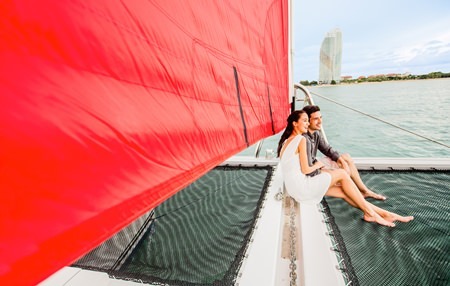 Complement your stay with a variety of excursions such as yachting and island exploration, all of which can be arranged by the friendly and knowledgeable Mövenpick staff. Facilities include the spacious Siam Grand Ballroom, which can be sub-divided into Siam Room I and Siam Room II, for smaller functions. An additional pre-function area and Marina I, II and III meeting rooms are also available. 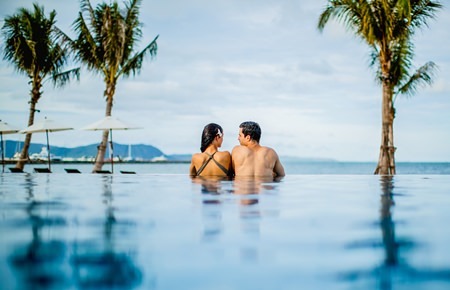 The dedicated Mövenpick team also provides tailored services and local insight to ensure guests thoroughly enjoy their experience and make the most of their time in Pattaya. An escape to Pattaya has never been so memorable. Stay with Mövenpick Siam Hotel Pattaya and enjoy impeccable, Swiss-style service with a warm touch of Thai hospitality. This hotel is sure to become your preferred destination for a revitalising beach escape. Soak up some stunning sunsets from the balcony of your guest room. Opening rates start from THB 4,999++ inclusive of daily breakfast for two persons (Period of stay 1 January – 31 March 2016). For more information: Phone +66 33 078 888, Email: [email protected], or check website: www.movenpick.com. Take a stroll along the beautiful white sand beach, just a stone’s throw away from the hotel. Next articleLong Live His Majesty the King!